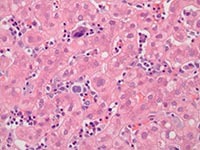 Cleveland Clinic Laboratories’ Hepatopancreaticobiliary Pathology Service provides diagnostic interpretations for biopsy and resection specimens from the liver, biliary tree, and pancreas. Our surgical pathologists, who have specialty expertise in liver, biliary, and pancreas pathology, interpret over 12,000 specimens each year. Our staff works closely with the highly-regarded Liver Transplant Program by providing diagnostic services for patients who receive liver transplants at Cleveland Clinic. 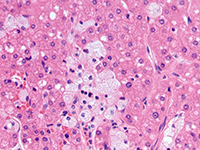 Specialty interests among Cleveland Clinic Laboratories’ hepatobiliary pathologists include viral hepatitis, fatty liver disease, primary biliary diseases, and chronic liver diseases as well as hepatic, pancreatic, and biliary tumors. Our staff has expertise in allograft dysfunction after liver and pancreas transplantation, and can provide comprehensive consultation on these cases. 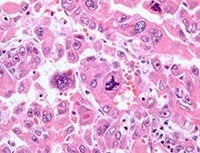 Our pathologists hold positions in the premier professional organizations in their field, and frequently serve as guest speakers at pathology meetings and conferences. Our staff publishes extensively in leading medical journals and have authored several book chapters in the field. Each member is actively involved in local, national, and international research in addition to teaching activities.